I know what you’re thinking… “What’s the big deal? Oracle bought a company. They buy companies more often than I buy milk.” While that may be true, this particular acquisition is very interesting for a number of reasons, some of which have implications for you as an Oracle customer. With the acquisition of Vitrue, Oracle has put “SRM”, or Social Relationship Management, on the corporate radar. Just as Customer Relationship Management (CRM) revolutionized how organizations deal with customers, SRM is a revolutionary way to deal with social media. In a world where blindly posting to Twitter, Facebook and Google+ qualifies as “social marketing” Vitrue steps in, revolutionizes social marketing and redefines what it means to truly “do” social marketing. Beyond merely posting a Tweet or adding content to a wall on Facebook, Vitrue offers capabilities like scheduling posts for evenings and weekends, selecting frames within a video to use as the thumbnail within Facebook, management of content and conversation across all social networks, delivery of content via mobile apps and perhaps most importantly the holy grail of marketing: methods to tie marketing activities back to sales via Vitrue Store and Analytics. Allow me to revisit that last point for just a moment because it’s very important to marketers. Not long ago GM significantly cut advertising money to Facebook because they concluded that social marketing was not significantly impacting vehicle sales. GM, like virtually every other company, has the ongoing challenges of measuring ROI on advertising and attempting to tie advertising activities to sales revenue. Vitrue offers several unique ways to meet those challenges and deliver true measurable ROI for marketing activities. The first and most obvious way Vitrue turns marketing activities into sales is the Vitrue Shop. This module links social conversations directly into a point of sales system within Facebook! Vitrue is the only social relationship management platform that incorporates social commerce. Additionally, the Analytics module within Vitrue gives marketers the ability to measure “reach” and negative feedback regarding posts. The analytics enable marketers to refine their activities and for the first time know which posts “worked” and which posts “failed.” Marketers can easily see the best times of day to post and the best days of the week to post as well. Tools like these provide amazing value to marketers who long for ways to measure the success or failure of an ad campaign regardless of whether the products they’re selling can easily be purchased in an on-line store. 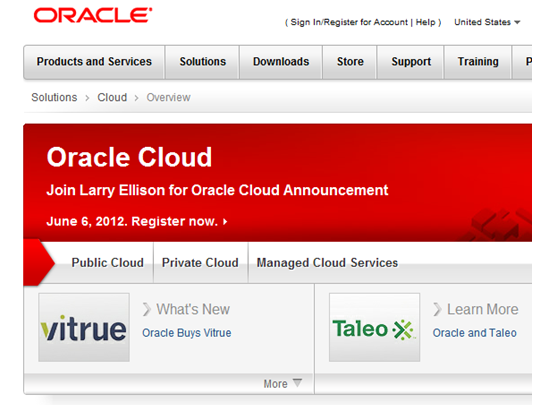 While it’s easy to see why Oracle pounced on the opportunity to buy Vitrue with all of the features it has to offer, long time Oracle customers are probably asking “how does this fit with the Oracle vision.” The most obvious clue we have is the Oracle Cloud website. Right there on the top is the news about the Vitrue purchase. Obviously Oracle is planning on rolling Vitrue into their cloud strategy which is summarized here by Oracle President Mark Hurd http://www.youtube.com/watch?v=5j2tocUCJiI. Exactly how Vitrue will fit into this strategy remains to be seen, but one thing we do know is that with the recent acquisition of Fatwire (WebCenter Sites) and now Vitrue, Oracle is focusing significant resources on delivering tools which give organizations the ability to engage with their customers in a way that has never been possible. Finally, regardless of whether your organization chooses to leverage the value within Vitrue, the acquisition by Oracle of a SaaS-based software product is yet another signal that Oracle is embracing a bold new way of doing business. This departure from a traditional server-based software revenue model is a huge step for Oracle and one that leads to some fun speculation. The possibility of WebCenter Portal, WebCenter Content, WebCenter Sites, JD Edwards, Siebel, PeopleSoft and other Oracle assets running in a SaaS model on an all-Oracle stack from the server to the database would certainly be an interesting value proposition for many organizations. I wonder if Vegas has odds on that happening.